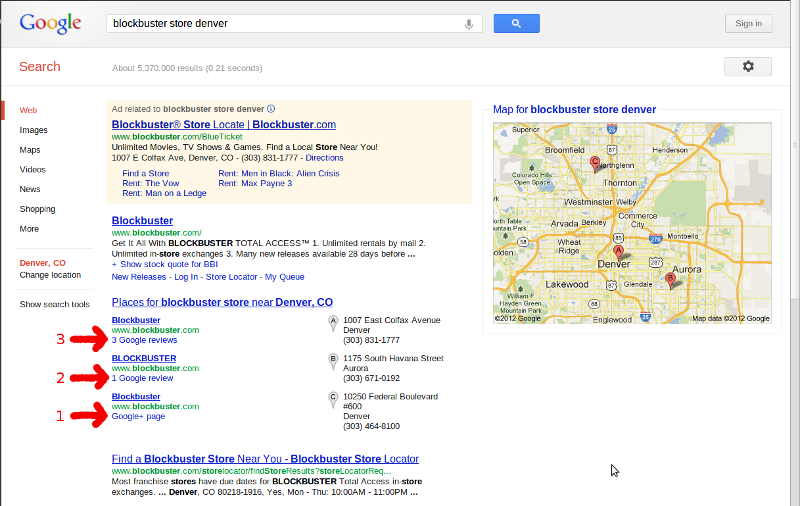 Last night (sunday), I was futility searching for a Blockbuster store to rent a DVD from here in Denver, I noticed that Google local search results were showing me something brand new, at least to me. 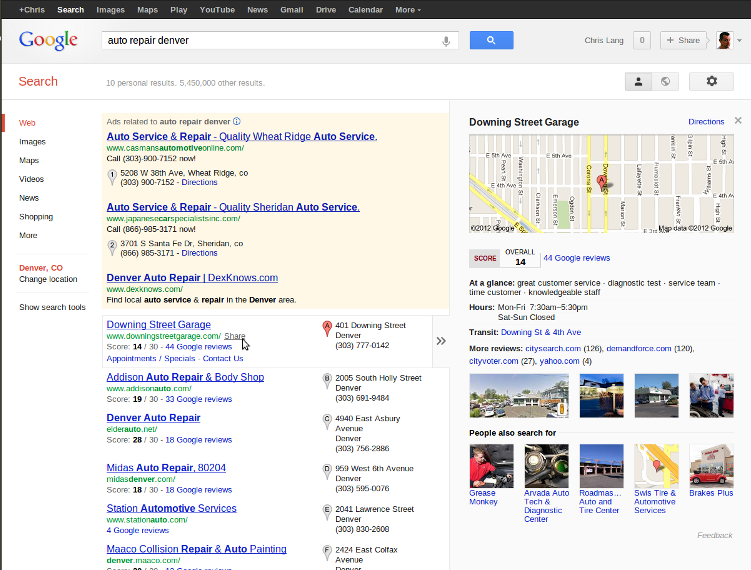 That was not just local results that of course now Google local Places pages of course are on Google Plus, but that the order of results directly correlated to the number of reviews. Also notice in the result below that if you have no reviews, Google local search linked to the page with the text “Google+ page”… That really got my interest up. Next, I decided to look a little further into if this was true, that Google is showing us what they want, and that is Google reviews and are they really a rankings factor? 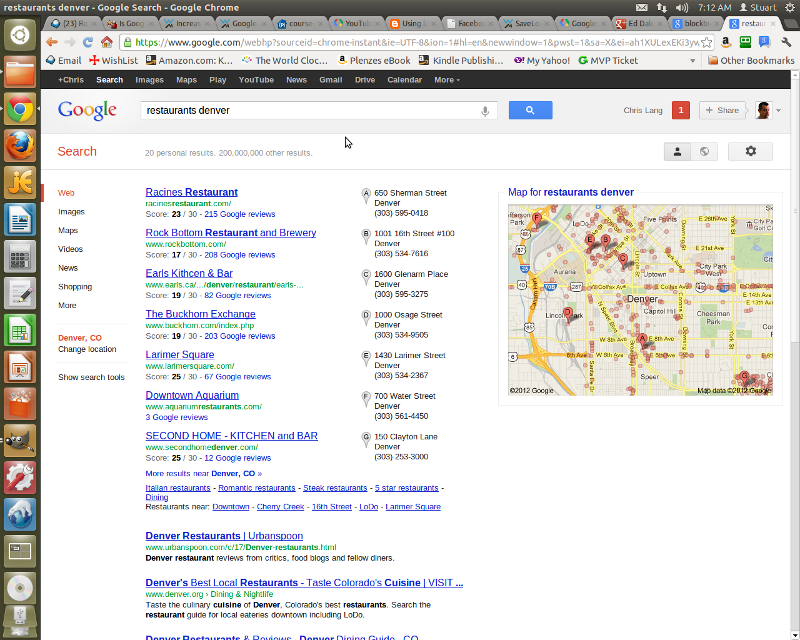 Upon doing a search for “Denver Restaurants” I next saw this result with Zagat ratings showing in results and appearing to have a say in rankings as well. Since Margie (my wife) and I, plan to go out tonight to see Denver’s Broncos for Monday night football, I searched the term “Denver Sportsbar” and you can see more of the same below. You can also notice again, that the number of reviews and the Zagat rating seem to be ordered in decending order again. 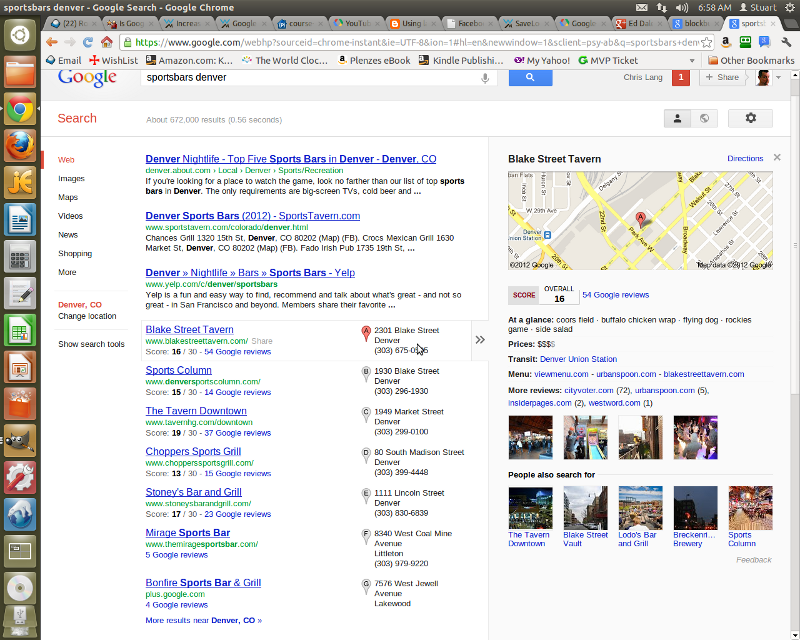 My next question was this: Is Zagat going to show up in non dining searches. 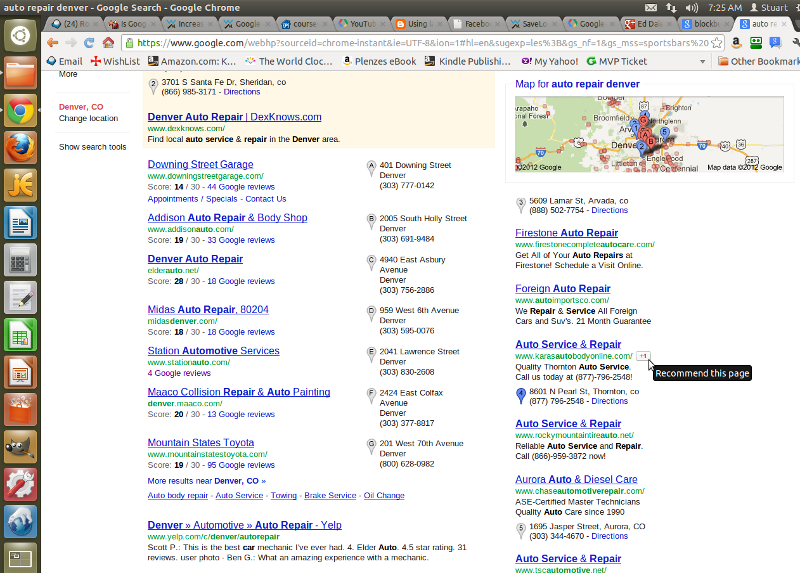 The answer is yes, in this search for “Auto Repair Denver” below. Of course we need to see if these results are centric to SPYW (search plus one your world), Google’s social search and to my glee, yes we see the same thing logged out below. Logging back in, let’s take a look at the Google Plus sharing tools that you may not have noticed are somewhat hidden in search results. 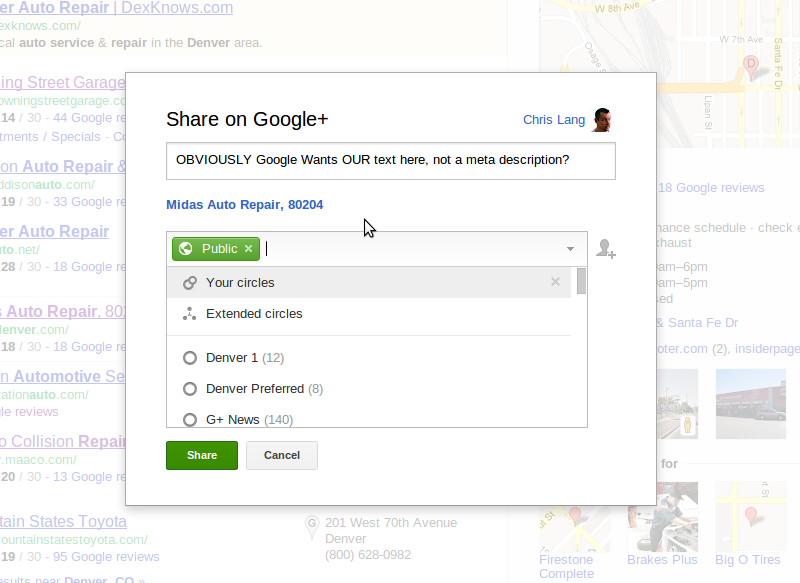 First off, you can share a local Google result to Google+ right from search. It is a bit hidden, so your competition may not know of this option. 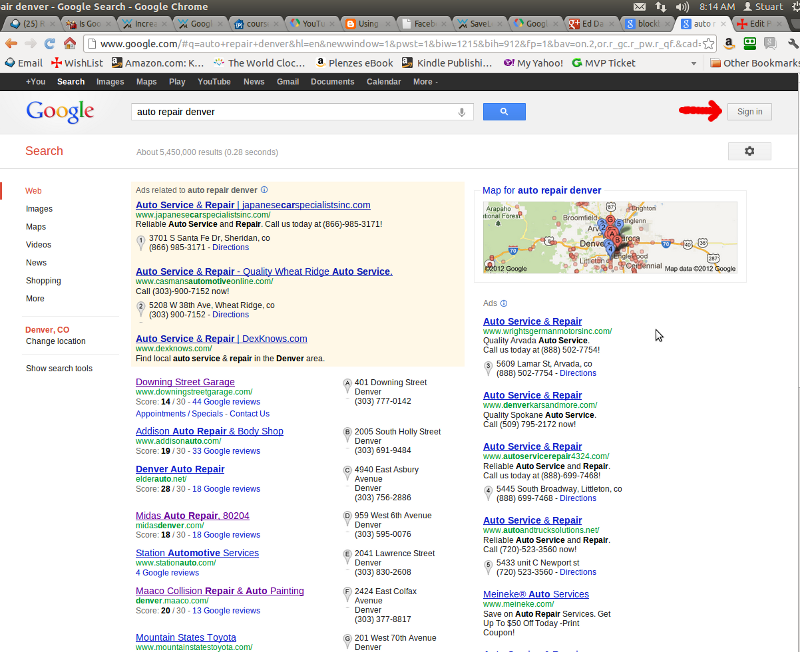 Now my question is “Does sharing from search have a effect on the rankings algo?” You can get my answer is yes! Since you are a motivated searcher, not someone who may have reviewed something for personally motivated reasons. Let’s take a look at what happens when you share from search. Right away you may notice that there is no description in the post, created from meta description tags or the page body text. 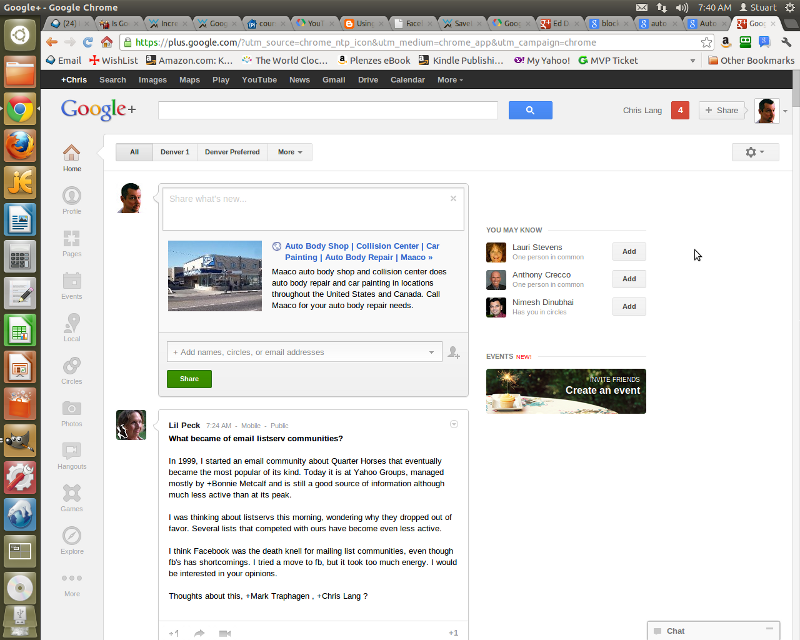 To see if it was the site’s meta tag or lack of one, I tried sharing the same link to Google+ manually. That tells me, at least for now, sharing from Google local results is more about what you have to say, not what the sites want to say about themselves via their own meta tags. But it also shows that yes, Google still uses meta tags and relies on them for rich snipptes, both in search results and Google+ posts. So be sure you have unique meta description tags on every page, post and domain. Finally while we have seen the +1 button no longer show up in many search results we are now seeing it seem very sticky in AdWords results. 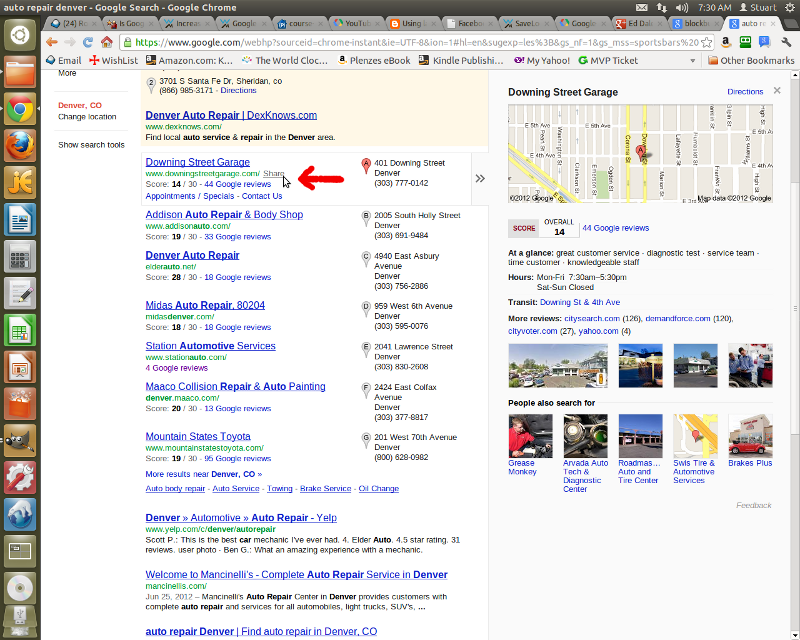 Take a look at the notation that the businesses ad is in the map and that you can +1 the add in search. This entry was written by Chris Lang, posted on September 17, 2012 at 7:45 am, and filed under Google Local Search and tagged google local search, zagat in local google search.